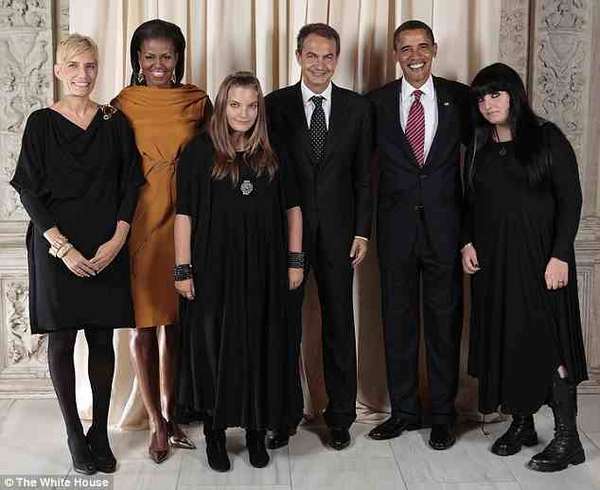 It started off as a friendly diplomatic meeting between Spanish Prime Minister Jose Zapatero, his family and the Obamas. However, after a photo of the group taken at the Museum of Modern Art was posted on the U.S. state departments Flickr page, it became a Spanish media frenzy. Some find it shocking that the Prime Minister’s daughters are dressed with a gothic flair, and their father has vowed to keep them protected from the media. While most can respect a father’s choice to keep his children shielded from a cruel public eye, many claim in this case he was clearly more embarrassed by their image than anything else. Gothic fashion seems acceptable on the runways of European fashion shows, and the situation seems it could have been worse if they had channeled the under-dressed pop stars of today.